Together with industry partners, Patagonia commissioned Ocean Wise’s Plastic Lab to investigate microfibers, the tiny textile particles that shed from garments over their lifetime. The scientists at the Plastic Lab have just completed the first phase of this research project, so we asked them for an update. While plastic debris in the ocean has rightfully attracted media attention in recent years, most people think of plastic fragments and bottles when they think of plastics in the ocean. However, microfibers as narrow as a human red blood cell dominate microplastic particles in the environmental samples studied by our team at Ocean Wise’s Plastics Lab. We began investigating microplastics in the ocean back in 2014. Since then our lab has investigated microplastics in the water and animals of the Pacific and Arctic oceans, in shellfish coastal British Columbia, and elsewhere. In a study of seawater from off the coast of British Columbia, Canada, we found that over 70% of all plastic particles were fiber shaped. Other researchers studying the Atlantic Ocean found that fibers comprise 90% or more of microplastic particles. In such large numbers, and because these fibers are so small, they are a threat to marine life that mistake them for food. 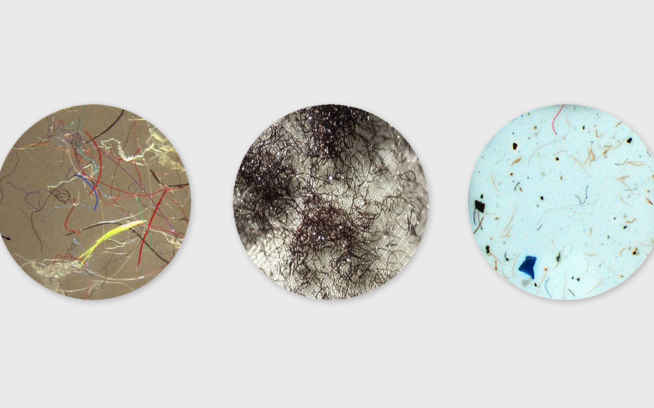 In Spring 2018, we partnered with Patagonia, Arc’teryx, REI, MEC (Mountain Equipment Co-op), and Metro Vancouver to begin a multi-phase research programme to investigate the sources of synthetic microfibre pollution, and to identify the best science-based solutions to the problem. During the first phase, each manufacturer in the partnership contributed samples of the fabrics used to make their outdoor apparel in a facility operated by Metro Vancouver. The study produced a unique data set of microfiber emissions from the textiles during washing. Thousands to millions of microfibers are shed from garments every time they are washed in a typical washing machine. The goal of phase 1 of the research was to determine which characteristics of the fabrics used in outdoor apparel are affecting the shedding rate of microfibers when washing clothes at home. To test this, we used washing machines and a filtration system to collect the microfibers released during a normal washing cycle. 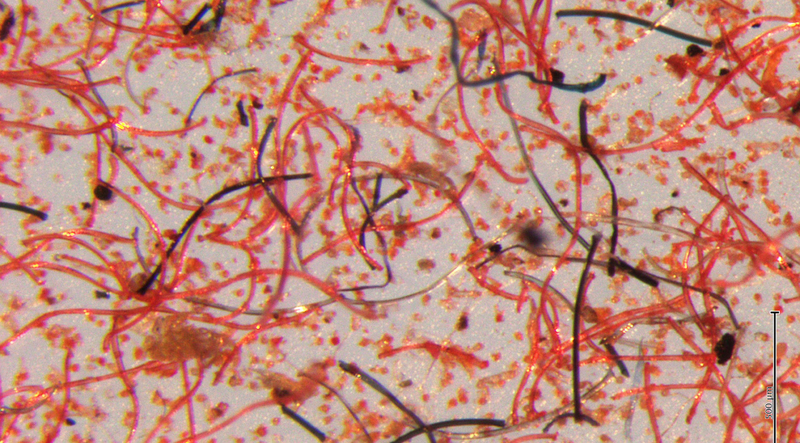 The microfibers lost by each textile were collected, filtered and dried. The lint accumulated on the filters was weighed and examined with a microscope to evaluate the mass and number of microfibers shed by the different textiles. Another goal of phase 1 was to determine what happens to different types of microfibers as they weather and decompose in the environment. For this experiment, our lab team exposed fabric samples contributed by the partners to atmospheric and oceanic conditions at the Pacific Science Enterprise Centre in West Vancouver, British Columbia for a full year. Some samples were collected during this time to carefully track the physical and chemical changes in the materials over time. The data from both the laundry study and the weathering study was used to create a reference library of spectra and shedding catalog for the most common textiles used in outdoor apparel. This will be a valuable resource for future research into microfibers in the environment, allowing Ocean Wise researchers to reliably identify microscopic textile fibers and help trace pollution back to its source. Textiles shed between 31,000 and 3,500,000 fibers per load during normal laundering in household washing machines. Not all textiles shed equally. For example, ‘fluffy’ textiles like fleece, as well as textiles made of spun staple yarns and textiles pre-treated with brushing are the highest-shedding types. These findings will be important for designing new fabrics that perform well but release less microfiber pollution. Some fabrics shed a large amount during the very first wash, and then shed little. This fact suggests that a pre-treatment during manufacturing may be able to capture and recycle what would otherwise go down consumers’ drains. Patagonia, Arc’teryx, REI and MEC will continue to work closely with Ocean Wise in the upcoming phases of the study, diving deeper into the results of the first phase and looking for emerging questions and opportunities to strengthen our understanding of microfiber sources and their impact in the oceans. If you’re interested in learning more about what you can do to help, check out the resources on the Ocean Wise website, and if you’re in town, swing by Vancouver Aquarium, an initiative of Ocean Wise, to check out the educational exhibits about microplastics. In the meantime, all the partners are enthusiastic about continuing this ground-breaking work and sharing the findings with the public. Stay tuned for future posts with more results from the lab. While we learn more about microfibers, here are some tips from Patagonia on what you can do to reduce the environmental impact of your gear. 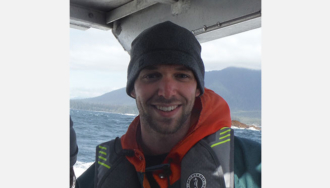 Stephen Chastain is the research technician at the Plastics Lab for Ocean Wise. He has worked on microplastics research since early 2017 and is passionate about science communication.